Beyond the role of economic forces, many theories of economic geography emphasize the way politics can shape the spacial configuration of economic activity. We investigate the impact of changes in political regimes on industrial concentration using 30 years of data on Indonesian manufacturers. These data span both the reign of Suharto, one of the strongest central governments in Southeast Asia, and its collapse and the subsequent decentralization of power. Using the canonical measure of Ellison and Glaeser, we show that in the mid 1980s, Indonesia's firms exhibited a similar degree of agglomeration as seen in the United States. Spatial concentration then declined until the 1998 Asian Financial Crisis, and has since begun to rise during the decentralization period. We also measure concentration using the continuous measure developed by Duranton and Overman (2005 ), and find that the agglomeration exhibited by Indonesian firms is also broadly similar to that documented by Duranton and Overman (2005 ) for the United Kingdom, although localization drops off more gradually in Indonesia than in the United Kingdom. Using this continuous measure of agglomeration, we identify 32 manufacturing clusters in Indonesia, and investigate the correlates of concentration. We find that the most robust drivers of agglomeration have been natural resources and supply chain linkages, especially with respect to explaining long-term changes in spatial concentration. 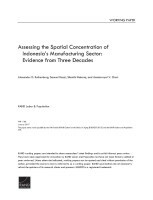 Rothenberg, Alexander D., Samuel Bazzi, Shanthi Nataraj, and Amalavoyal V. Chari, Assessing the Spatial Concentration of Indonesia's Manufacturing Sector: Evidence from Three Decades. Santa Monica, CA: RAND Corporation, 2017. https://www.rand.org/pubs/working_papers/WR1180.html.